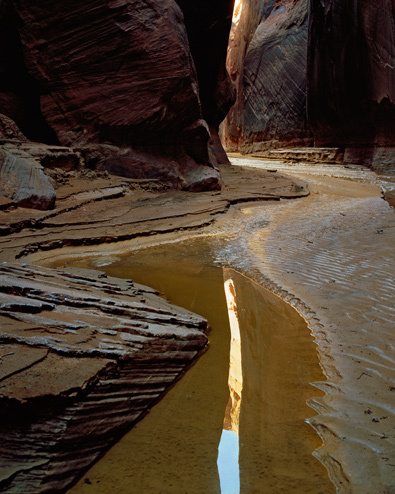 Cascade, Tributary To Clear Creek, Zion National Park, Utah, copyright 1978 by Philip Hyde. From "Drylands: The Deserts of North America." 4X5 Baby Deardorf Large Format View Camera. Original dye transfer prints, Original Cibachrome prints, archival digital prints by Carr Clifton. The great architect of this beautiful landscape is moving and falling water, and to this builder and remover of the landscape can be attributed the deep canyons of the region. The violence and power of moving water is often forcefully demonstrated during a summer thunderstorm. One of the writer’s earliest and most vivid recollections of travel in this area stems from a summer visit to Zion Canyon, when he arrived in the midst of a cloudburst. The violence of the storm was enough to justify repetition of Chicken Little’s oft-quoted exclamation: “The sky is falling!” I still have a vivid mental picture of the brown torrent that was the Virgin River, gnawing great chunks from its banks, ripping out trees, carrying debris before it in the surging current. After the climax of the storm passed, the raging water quickly abated, and within a few hours the brown flood disappeared, to be replaced by the river’s normally quiet murmurings. Even during its quieter periods, however, the river is actively working on the confines of its bed. 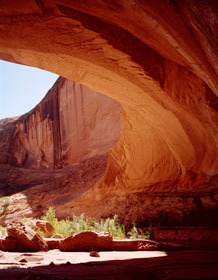 The low resistance of sandstone to erosion, combined with the steep gradients of the streams in this region, result in a rapid deepening of the stream canyons. Because of these two factors, the stream plays a lesser part in the process of widening the canyon. Seepage of ground water, direct action of rain water, and frosts produce the curves and crenelations that add so much to the sculptured beauty of the canyon walls. 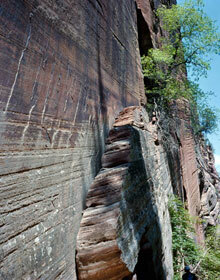 The east side of Zion National Park displays progressive steps in the erosion cycle. In the beginning of this cycle, the land is relatively flat, illustrated by the present tops of plateaus. Where a stream gathers its waters from a small area, the stream remains small, probably runs only in response to rainfall, and manages to cut only a small canyon. The east Zion area contains many examples of this phenomenon; they are within walking distance of the highway, and can be more closely studied. In many respects these small streams are miniatures of the larger ones. They demonstrate processes and effects similar to those evidenced on a larger scale by their bigger brothers. Another most interesting feature of the Zion region is the frequent occurrence of rock pedestals on the broad stone pavements near the highway. A closer examination of such pedestals reveals that they are capped by a material differing from the soft sandstone of the base; a layer of iron oxide that geologists believe was intruded, in solution into the sandstone. Since this material is harder, and therefore more resistant to erosive forces, it has protected the softer material directly beneath it while the surrounding material was being eroded away. So, when you look at these pedestals, you are really seeing a remnant of the layers of stone that formerly covered the presently exposed surface. The balance of this material has been carried away, either as wind-borne sand, or by stream action, to be deposited as part of a sandbar somewhere downstream. Or, perhaps it will find its way eventually to the sea, to be laid down as part of a delta at the Colorado River’s mouth. In these pedestals, as in the rest of the landscape, can be read one of the grand lessons of geology—that Nature is not at rest, but is ever active, ever changing the face of the Earth; that even the stones, cold and dead to our eyes, have their own inner life and being. In the slow passage of geologic time, the surface we look at today will pass away to join its predecessors, each succeeding layer following in its turn, until Nature decrees a major change—such as has occurred we know not how many times past—to commence the cycle again at what men are pleased to call the beginning. From Wikipedia: American Nature Association, headquartered in Baltimore, Maryland, was the publisher of Nature Magazine from 1923 to 1959; and a discount reseller of natural science books for its members. It was founded by Arthur Newton Pack and his father, Charles. Nature Magazine was an “illustrated monthly with popular articles about nature” and later, the “interpreter of the great outdoors.” A May 1924 review of the organization and its magazine, written by Carroll Lane Fenton and published in American Midland Naturalist called the magazine “excellent” with “abundant pictures, admirably printed”; and said it was a “highly worth while publication” that deserves a wide circulation among town and school libraries.” Natural History magazine absorbed Nature Magazine in January 1960. 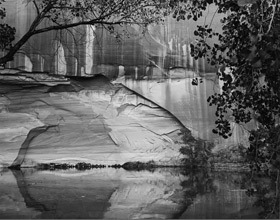 Wall Of Hidden Canyon, Zion National Park, Utah, copyright 1977 by Philip Hyde. To a casual tourist, the eastern portion of Zion National Park in Utah may be just an area through which to pass quickly on the way to the spectacularly beautiful, pink and white walled Zion Canyon on the Virgin River. 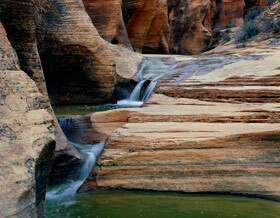 It is this Zion Canyon that gives its name to the National Park. A closer look along the way, however, reveals many highly interesting facts and features. If the visitor is interested in poking a bit beneath the surface appearances of the landscape, this country will come alive for him. Here are all the ingredients that went into the making of the more showy Virgin River canyon, but in this eastern area it is possible to examine them more intimately. This part of the country is reached on Utah State Highway 15, from the west by way of Zion Canyon, or from the east from Mt. Carmel Junction. The traveler from the east will find the formations on the way to Zion National Park from either Bryce Canyon National Park, on the north, or Grand Canyon National Park, over the Arizona line to the south. In a region so abundant with colorful natural wonders, this area fully deserves its status as part of one of the great National Parks established to protect these natural wonders. If you come west from the Mt. Carmel Junction, into Zion National Park, you will emerge gently into this colorfully carved introduction through Zion Canyon. The highway from the junction runs roughly west, climbing first over a series of plateau-ridges, then, near the entrance checking station at the Park boundary, it begins to descend gradually. 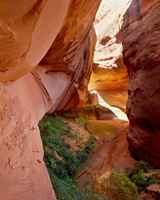 Almost before you become aware of it, small canyons are born and mature rapidly on either side of the highway. By the time you reach the east portal of the Zion-Mt. Carmel tunnel the canyon that the highway has rough paralleled has become a vertically walled abyss. Intermingled with the deepening system of canyons that form the drainage of the usually dry plateau are great, gradually sloping, stratified sandstone pavements, with their delicately eroded concentric curves that are the delight of photographers and painters in search of interesting forms and color. The formation exposed in this area is the same Navajo Sandstone that forms the top layers of the cliffs and towers of Zion Canyon. Seen in these more intimate and accessible surroundings, the erosion sculptures fashioned by the artful fingers of wind and water can be more closely appreciated. In the washes at the feet of these stone pavements, in the proper season, are many and varied wildflowers and plants. If your visit occurs during early summer, you may be rewarded by the sight of the bright-plumed spikes of yucca, or clumps of the brilliant orange butterfly milkweed. The sharp, linear, spike-like forms of the yuccas are in pleasing contrast to the swirling curves of the stratified rocks. Probably the landmark that will be first remembered by most visitors to Zion National Park from the East is the pale pyramid of Checkerboard Mesa, whose bulk is framed in one’s windshield shortly after leaving the checking station. This is a well-known example of what geologists call “cross-bedding,” and tells us that this region, in a remote period of earth-history, was a dry, sandy, desert-like place. Only the caprice of desert winds, constantly shifting loose sand, could produce the intricate layered patterns as we see them today, solidified into rock. This rock, however, is relatively soft, and is highly susceptible to the sculpturing forces of erosion that patiently pluck it away, grain by grain. 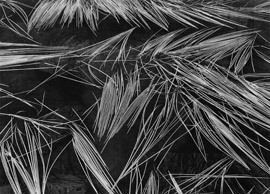 Grass On Tarn, Sierra Nevada High Country, Kings Canyon National Park, California, 1951 by Philip Hyde. This was one of the photographs with the original Christian Science Monitor article, "Why Not Walk?" by Philip Hyde. Next time you visit one of our national parks, why not try walking? If this proposal seems startling to you in this mechanized age, you might consider some of the qualities that make up the natural scene that is observed in our system of national parks. One of the most rewarding aspects of nature is the exquisite beauty found in minutiae: the patterns of snow-flakes, the form of a tiny butterfly, or the interlaced perfection of leaf forms. None of these are easily observed from a moving automobile, yet most visitors to our nature preserves depend primarily on wheeled locomotion to “see” the parks. You can look at the grand landscapes in the parks through the windshield. But to really see them you must get out of the car, at least enough to look at the foreground. No mountain is so grand that knowing its foreground of small stones, tiny plants, and even the animals that inhabit it does not enhance its grandeur. For the natural world is not a miscellaneous collection of unrelated pieces, but a unified, harmonious whole, interacting and inter-dependent. What is your favorite place to walk? Do you walk when you go to national parks?